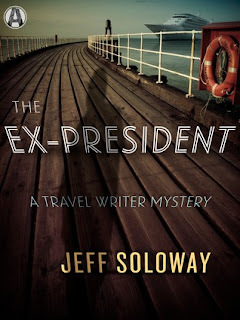 In award-winning author Jeff Soloway’s timely new Travel Writer Mystery, Jacob Smalls sets sail for dangerous waters—a cruise headlined by the billionaire businessman who became president of the United States. Carlton Chomp, the notorious right-wing business tycoon, and television personality shocked the world by becoming the president—and then shocked it again by resigning after only two years in office. After months in exile, the ex-president is returning to public life by headlining a cruise to a private island in the Bahamas. Travel writer Jacob Smalls is assigned to review the cruise. He brings along an undercover ally: his mother. Together they plan to investigate the ultimate in political mysteries. Why did Chomp resign? And why is he making a comeback? On the day of the cruise, the departure city is enflamed with massive protests, counter-protests, and violence on both sides. When one of the ship’s passengers is found dead that evening, Jacob is faced with an even more urgent question: Was Chomp himself behind the murder, or was it one of his desperate political enemies? The search for the truth will take Jacob and his mother off the ship and into the dangerous tropical landscape of the cruise line's private island, where Chomp and his supporters will finally reveal what they’ve been planning all along. I have spent hours agonizing over how to write a review for this book. It's brilliant, and I fear I cannot do it justice no matter what I say, but I shall try my best. First, yes this isn't going to be worded like most of my other reviews simply because this is completely unlike any book I've read thus far. It is a thrilling mix of satire, mystery, and a terrifying glimpse into a future that might yet come to pass. You'll be hooked immediately and before you know it you'll be knee deep in political intrigue and murder. I'll definitely be reading the first two books in the series!